Andrzej Haręza is a sculptor and carpenter living in a house he built in the village of Talki in Masuria, a province of northeastern Poland. For twenty-five years, he taught visual arts at a primary school. He is currently retired and focuses mainly on artistic activity and craftsmanship. A few years ago, Haręza was inspired by the ratchets and rattles that children used in the (dying) tradition of mid- Lent, in which they would run from house to house making noises with instruments and shouting, “Mid-Lent! Mid-Lent!” in exchange for some coins and sweets. The sound of ratchets and rattles was supposed to wake people up from their winter lethargy. Haręza constructed his rattle on a 1:1 scale in protest against the commercialization and high level of fees for stalls at the folk fair in Węgorzewo, and used it during the December demonstrations organized by Komitetu Obrony Demokracji (Committee for the Defense of Democracy) in Ełk. 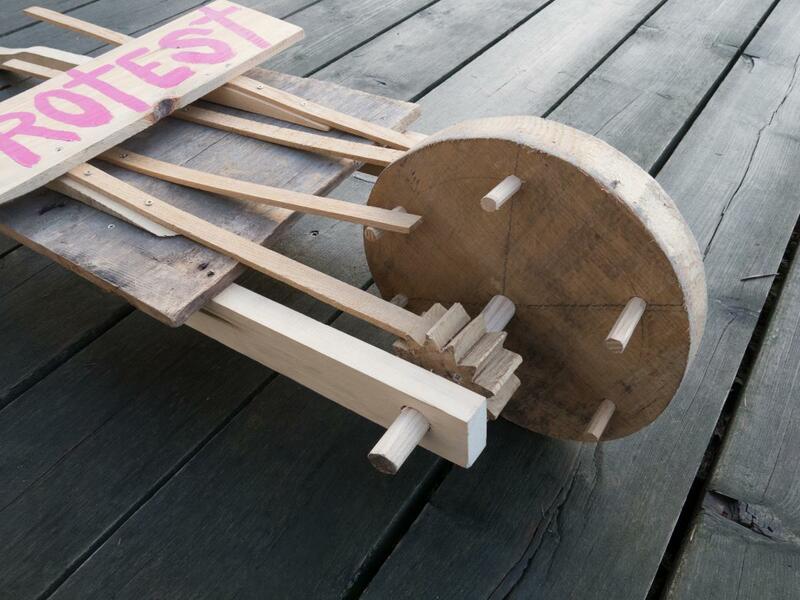 It is a handy and efficient protest tool, formally resembling Jerzy Bereś’s wooden sculptures and his Taczki polskie (Polish Wheelbarrows) from 1966. The report presented in exhibition consists of a ratchet loaned to the Museum of Modern Art in Warsaw for the duration of the exhibition. Courtesy Andrzej Haręza.